"I would consider this the bible for any Canadians wanting to invest in US real estate." The thought of buying property in the United States has been on your mind. Perhaps family members or friends already own real estate in the Sunbelt and you've enjoyed the occasional visit. You sense the market isn't as frenzied as it once was but there is still very good value to be found. Whether you are looking for a vacation home or an investment property, you are certainly not alone. For Canadians generally, and boomers especially, the right property in the right destination point is integral to their life-rich philosophy. 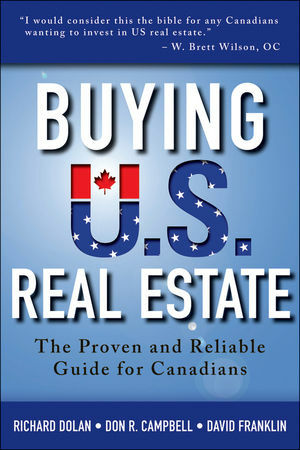 Buying U.S. Real Estate: The Proven and Reliable Guide for Canadians puts all of the pieces of the puzzle together and is an essential guide to reaching one's ultimate destination. Richard Dolan (Toronto) is the CEO and Senior Analyst of the U.S. Property Shop, a U.S. real estate capital advisory and research company based in Toronto. ?Dolan has co-designed two certification programs, Certified Wealth Management & Marketing and Selling Wealth Management Services, which are offered at the Schulich School of Business, York University. Don R. Campbell (Vancouver) is a Founding Partner of the Real Estate Investment Network(tm). ?He is a leader in providing Canada's most current real estate investment education programs and economic research materials, and is the author of the best-selling Real Estate Investing in Canada 2.0 and co-author of 97 Tips for Canadian Real Estate Investors; Real Estate Joint Ventures; and Secrets of the Canadian Real Estate Cycle. David Franklin (Toronto) is counsel to The US Property Shop and an expert on Canadian and US real estate.